Until this point on my blog I have focused on what I consider to be the most important primary meanings and powers of gemstones, meanings that apply to the bearer no matter who he or she may be. But there are other stones that hold enhanced power for certain people depending on their month of birth. These are called birthstone gems. The primary meanings of these gemstones still apply to the bearer, with but with extra intensity. It is also believed that wearing the birthstone for your month brings you good luck in general. Some also believe that birthstones simply correspond to a month, and that if you wear the birthstone of the present month, you will receive the increased power from that stone. I personally don't subscribe to this, I believe the increased power corresponds to your month of birth only. The concept of a birthstone gem stretches all the way back through history to Biblical times, and has been recorded in many cultures. Which stones correspond to what month and the birthstone's meaning for the bearer differ from culture to culture, but the Tibetan birthstones dating back to the 15th century are often considered the standard list. 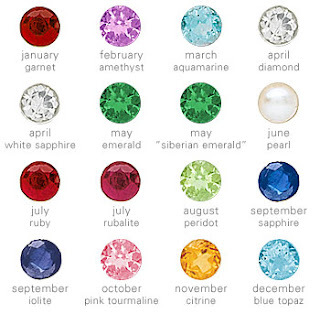 Another modern list of birthstones corresponding to months was adopted by the National Association of Jewelers in 1912. Just how much traditional brithstones played an influence in the choice of gemstones I don't know, but I have heard that it was influenced by birthstones used in Poland around the 17th centurey. but I myself prefer the Tibetan list. Some of the stones are the same on the Tibetan list and the Modern list.